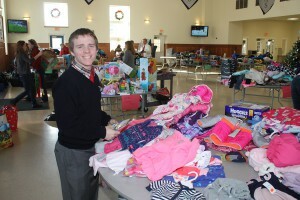 Malvern sophomore, Patrick Sayers of Drexel Hill, helps sort the more than 1,500 toys and outfits donated by the Malvern Prep community for the children of St. Pat’s in Norristown. 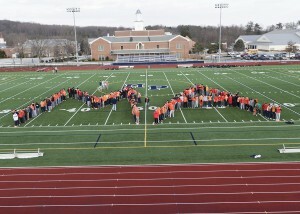 MALVERN – Giving back is at the heart of the mission of Malvern Prep, and the school’s students, parents, teachers and alumni consistently seek ways to do good in our society. Malvern’s Christian service program sends students across the globe to work with the world’s most vulnerable people, but most of the time, the Malvern community tries to make an impact closer to home. 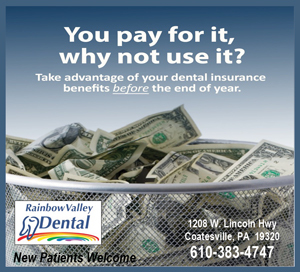 This year, the school learned that the St. Patrick’s Parish in Norristown has many children in need this Christmas season. This parish is comprised of mostly Hispanic families, many of them migrant workers and many are struggling to put food on the table, let alone put presents under a Christmas tree. 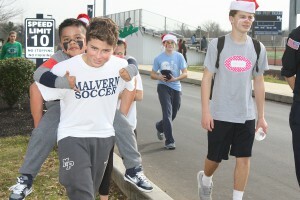 Malvern freshman, Jackson Powers of West Chester, gives a ride to a new friend from St. Pat’s in Norristown. Larry Legner, Malvern’s Director of Christian Service, challenged the Malvern community to respond to these families in need, and did they ever. Malvern collected more than 1,500 toys and outfits, which were sorted by gender, age and size and shipped to St. Patrick’s to be distributed to their families. The School also collected gifts to fill Christmas stockings for 140 children in St Pat’s First Communion Class. The children received these stockings at the School’s Christmas Party for them on Sunday, December 13. More than 100 student, parent and faculty volunteers from Malvern Prep and Notre Dame Academy staffed the party, which began with Mass in Spanish and featured lunch, crafts, face painting, soccer games, swimming and fire engine rides, courtesy of the Norriton Fire Engine Company. Malvern’s Santa (Jimmy Faunce, a senior from West Chester), and his elf helpers (Cullen Pina, a junior from West Chester, Matt Dinehart, a senior from West Chester, Ben Yankelitis, a senior from Phoenixville, and Chris DeStefano, a senior from Broomall) were there to hear Christmas wishes and hand out the goodie-filled stockings. 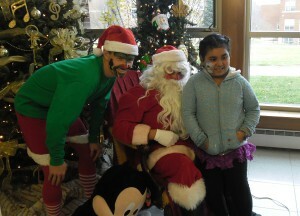 Malvern’s Santa Jimmy Faunce and his elf helper Cullen Pina, both from West Chester, were there to hear Christmas wishes and hand out goodie-filled stockings. Malvern senior Billy Murphy, a Malvern resident, volunteered at the event, and he was glad he did. “These kids don’t have much, and just getting a chance to put smiles on their faces was worth it,” he said.